Mack Trucks -- Are We There Yet? Elsewhere I mentioned the romanticism of the railroad. Well, believe me, a 1907 Mack will really get your heart to pumpin'! Other models ranging through the year 1973 can be seen, all beautifully restored and on display. 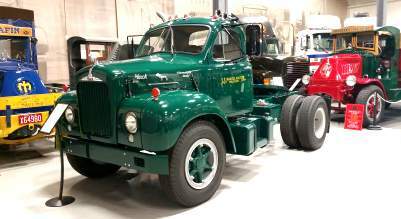 An archive provides researchers the opportunity to answer many of their questions about Mack vehicles. The Mack Shop featuring unique gifts, from hats to toy Mack trucks, is the perfect end to a great visit. Practically a must for any School Group from shop class. Hours: Museum is open Monday, Wednesday and Friday, 10:am - 4pm. There are various closures throughout the year. Please call before your visit. Call for tour scheduling information. Groups (5 or more): FREE. Handicapped Access: Extremely limited. Call for details. Directions: Obtain directions when making reservation. 60 - 90 minutes northwest of Philadelphia.